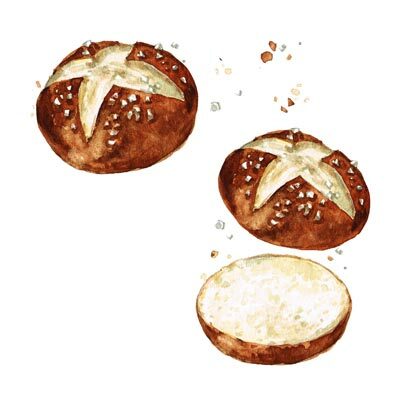 This week we are going to paint a few buns and rolls. The idea behind repeating these exercises is to learn to create not just simple round shapes in watercolour but also to show slight variations within the a seeming round surface. 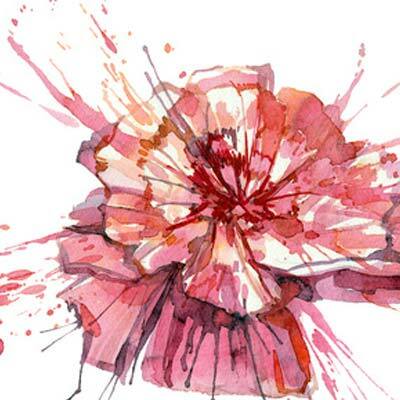 ​You can use masking fluid for smaller sharp edged bits and pieces. 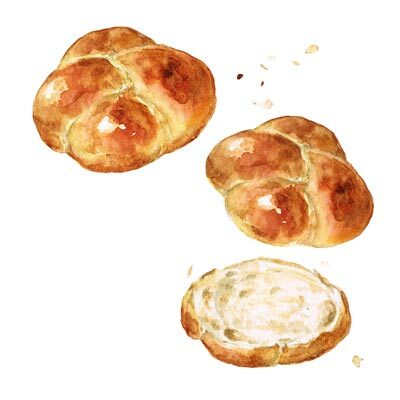 If you have problems seeing colour as tonal values, I would suggest for this illustration that you get a photo of a Chailah Roll and print it in black and white. Or if you paint from real life use a tonal value scale to see where each tone lies between 0-10. ​It is due to the tonal value that this watercolour is getting its 3D effect. What an interesting surface the typical brioch bun examples? Try to study the surface very well, start with the lightest colour and proceed to the darker ones one at a time. 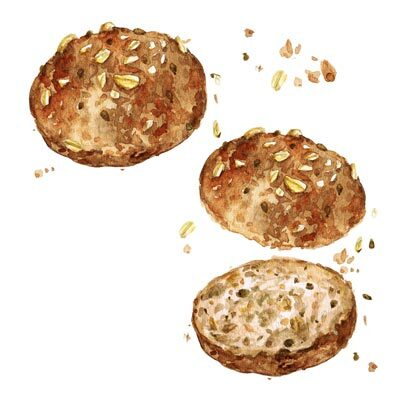 Our last day of rolls and buns, the whole grain roll. You can work the lightest areas by using masking fluid. 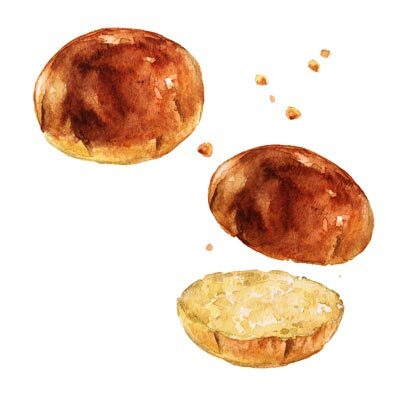 ​Note that sharper more square like forms are added in comparison to yesterday's buns, where the surface was much softer altogether. It is important to study each colour and its shapes to understand the main pattern. 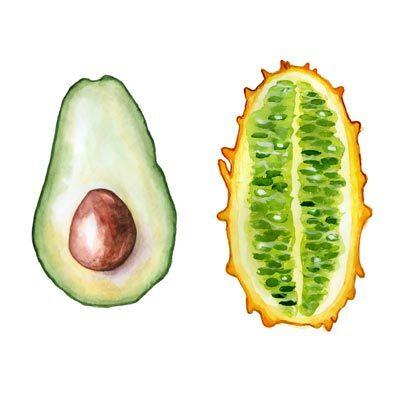 Today you have the choice between the cross-section of an avocado or a Kiwano fruit. The Kiwano is native to the Kalahari Desert and is also called the horned cucumber. 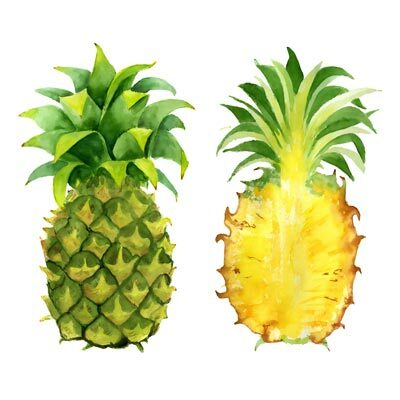 Painting a pineapple will finish off our first week in June. 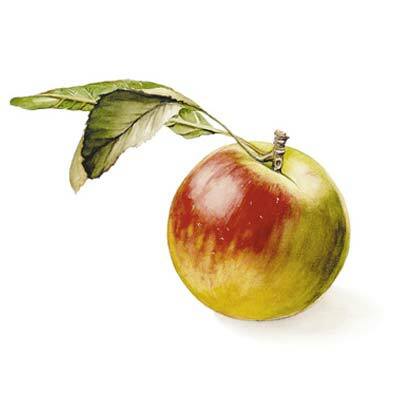 Both the outside and inside the fruit show interesting features that can be painted relatively easily. 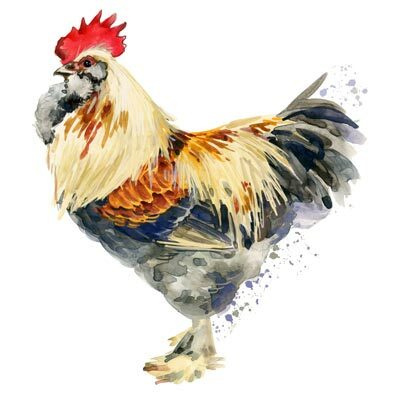 I love chickens, so we will be painting some roosters and chickens this week of some special breeds. 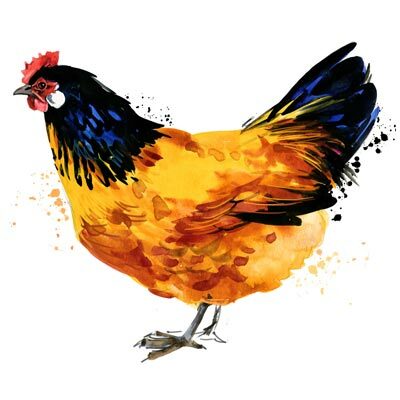 We begin with the Faverolles Rooster, a french breed in the vicinity of Faverolles. In watercolour you begin with the lighter colours and work your way into the dark. To create the grey, don't just use black, because we can see a more violet grey and another more green. Grey is mixed with all three primary colour but most blue, then red and last a little yellow, plus lots of water so that the paper can create the lightness. 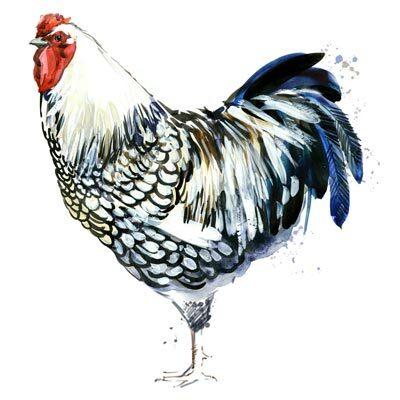 Today we will be painting the stunning and proud Ancona breed of a rooster that originated in Italy but was bred until today mostly in the UK. It was named after the capital city of Marche. 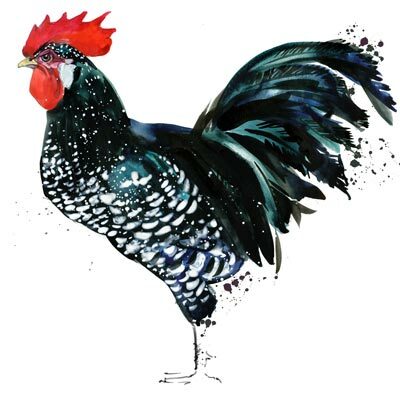 ​The blacks of this rooster contain both flurescent blues and greens. We are painting today a chicken of the breed called "Vorwerk" that originates in Germany. Not related to the famous Vorwerk company that sells vacuum cleaners. Notice how the body plumage is beautifully golden colours. The Leghorn originated in the Tuscany in central Italy. 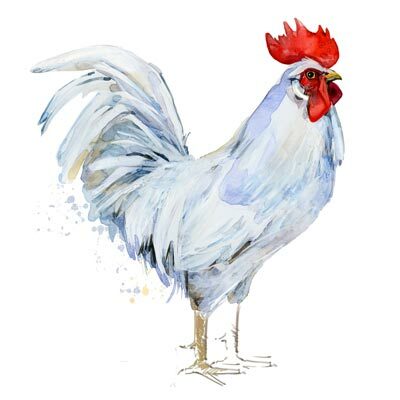 The beauty of painting this rooster is the variations of white one can add to make the painting more interesting. From blueish to purple through to green and yellow, all variations of light colours can be seen. Today we finish our series of chickens and roosters. The Wyandotte chicken is an American breed that was named after the Wyandot people of North America. They are amazingly beautiful. 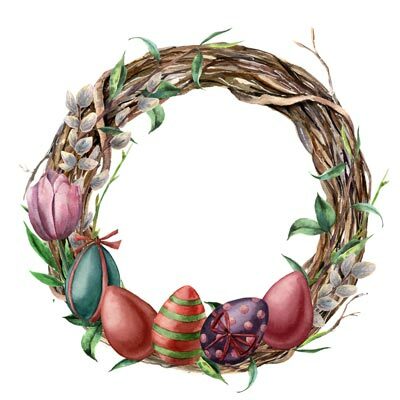 After all this work on chickens and rooster it comes almost natural that we end the week with some colourful eggs. The technique for the bear is little more wet in wet. Slightly wet the surface of one leave with water and then apply the watercolour. Allow the colours to run into each other. For the lighter veins you can use masking fluid. Choose a simple flower shape and go wild today. For the splatter effect use an old tooth brush and dip it into the paint and flick. Test it on another sheet before to understand how soft or hard the drops will be with your particular tooth brush. ​You can see in the dark violet red sections that the colour was allowed to run down the paper. Ahhh, strawberries what delight. 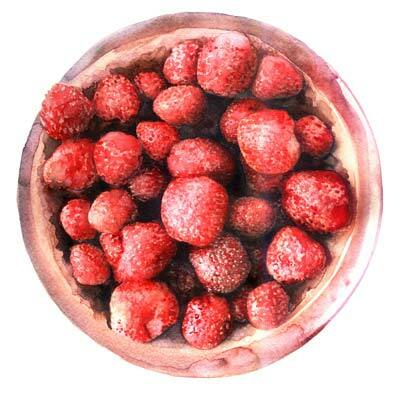 To make the strawberries appear three dimensional watch the that there is a light area almost in the middle of the berry followed by a brighter saturation band (meaning a brighter band of colour before the more duller and darker shadow colour is applied. Decide which dots you want to mark with masking fluid before you start to keep some of the smaller dots white without a fuss. 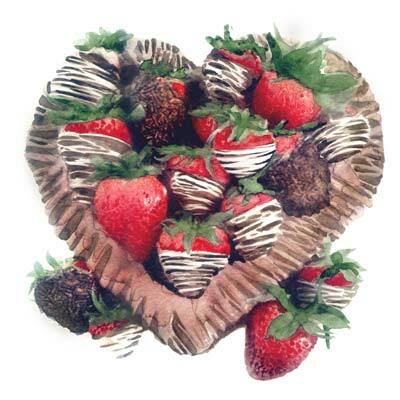 Strawberries again, but this time with bits of melted white and dark chocolate. Don't you just love the colours? Sorry, can't help myself. Yesterday's painting was so inspirational and I could not get off the chocolate part today either. 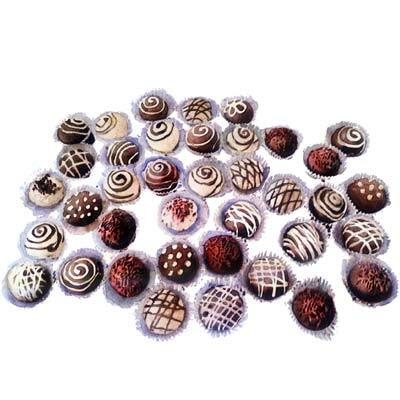 The forms in themselves are pretty simple, so the curling effects, dots or lines on each chocolate toffee. You just need to get a natural toffee colour. Also watch that the spirals are aligned in a way that you can see that you see more of the top in the from and more of the side of each Toffee at the back. That creates a good 3D effect. 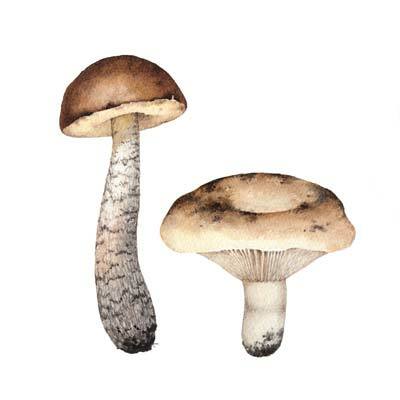 Draw a toadstool mushroom or any other type. 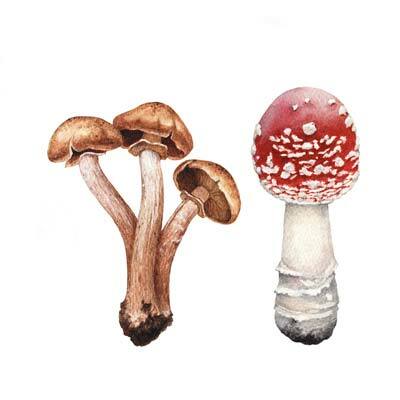 Are the red and white toadstool mushrooms edible? No, they are generally very deadly, as they can cause liver and kidney failure, despite what some weird websites are saying. The greylag goose, not to be confused with grey legs, is an ancestor of the most domestic geese and the largest and bulkiest of wild geese native to the UK and Europe. 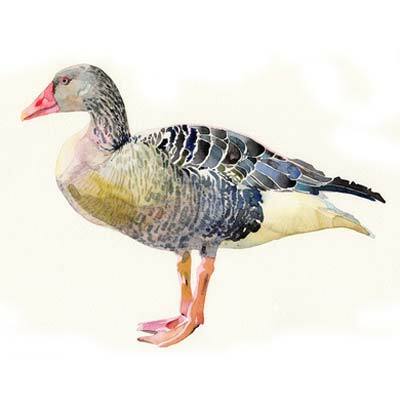 Please note how the lower part of the goose is softer which you can achieve by adding several layers of yellow pinkish watercolour on top of the feather indications, rather than drawing the feathers on top of an underpainting. 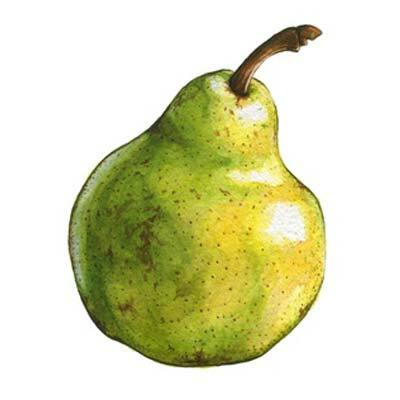 A simple pear will do today. Enhance the dimensional form by watching carefully where the line between the light and the shadow areas are. Also not the highlights that are lying near or above curvatures. When adding the little spots, please don't make the too dark, which is the most common problem with beginners. It is likely that the tonal value is lighter than you think. Also note the wonderful hard edge surrounding the pear. 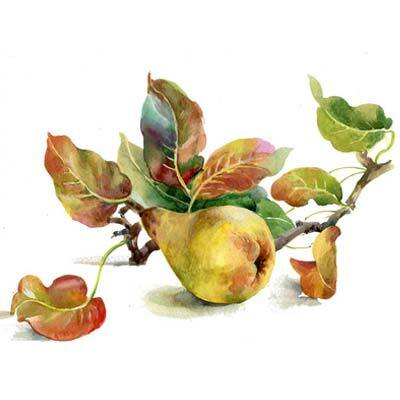 When drawing any kind of fruit, it is always a good idea to get a fresh example inclusive some leaves. It just creates a little bit of interest. To get that wonderful dulled version of a yellow green, add the tiniest amount of red to the green to achieve this. 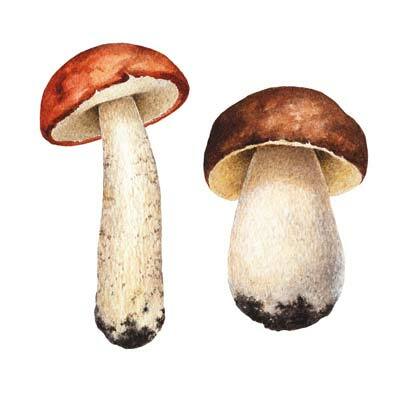 Today I want you to buy some different kind of mushrooms for today and tomorrow'a paintings. Even if you just one each. Study the different surfaces. When adding the darker details in the stump, be careful not to overdue the colour, but rather stay a little lighter in colour than you think. 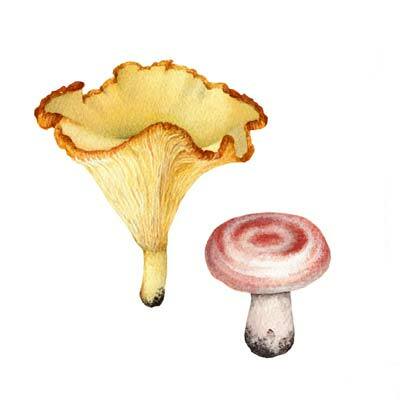 The chanterelle mushroom, also called egg mushroom is an interesting species and are highly prized for their exquisite flavour, colour and texture. Once again, when adding the details on the underside of the mushroom, use very light colours as most beginners go overboard. One last day of our mushroom trip. By now you should have learned or overcome one of the most common mistakes that beginners tend to do. Namely when details on surfaces appear that are darker than the rest like on the stem of the mushroom, beginners tend to go overboard with the darkness of those details. The tonal value is often far lighter than expected. When painting a rather complex texture it is best to squint your eyes and look for the main underlying colour of each section. 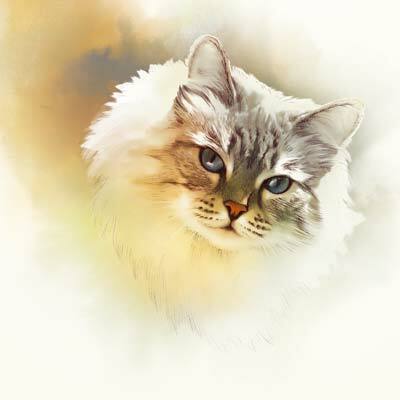 The area above the nose right up to the ears for example has a greyish calm undertone upon which we have only a few smaller segments of darker colours. Really much less detail than the right side of the brain believes to be there, counts for the yellowish area underneath the left ear. There is only little detail if you see it simplified. 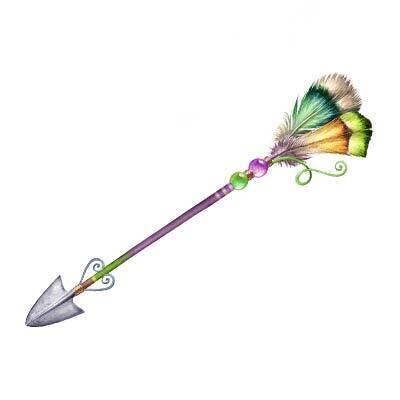 Once more we are painting one of those simpler but beautiful and colourful arrows as your daily painting.